As we begin the 21st century, the State of California, the University of California, and hundreds of the state's leading-edge businesses have joined together in an unprecedented partnership to lay the foundation for the "next New Economy." The OptIPuter, so named for its use of Optical networking, Internet Protocol,and computer storage, processing, and visualization technologies, is an infrastructure that will tightly couple computational resources over parallel optical networks using the IP communication mechanism.The OptIPuter exploits a new world in which the central architectural element is optical networking, not computers—creating "supernetworks." The combination of personalized (genomic) medicine and the application of wireless and sensing technology to health care delivery (digitally enabled medicine) will provide enormous benefits to the citizens and communities of California, the State's economy, and our society in general. 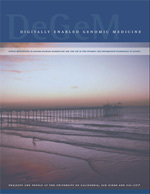 High-speed, high-bandwidth wireless communication and sensing devices linked to powerful, interoperable clinical and biomedical databases will empower physicians, extend delivery of genomic medicine to remote clinical settings, increase certainty in diagnosis, and improve effectiveness in clinical practice while reducing costs. 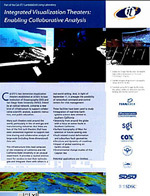 Calit2's two immersive visualization theaters established at UCSD's Scripps Institution of Oceanography (SIO) and San Diego State University (SDSU), linked by an optical network, comprise a new kind of infrastructure to support collaboarative scientific analysis, academic instruction, and public eduction. Many such theaters exist around the world, particularly in the oil-and-gas and manufacturing industries. But these are two of the first such theaters that have been networked together to support real-time sharing and collaborative analysis of large-scale (including three-dimensional) data sets.